Crafting Confessions: Buttons + Balloons = Happy! Anyways, I digress! I'm sharing a card today that I should have shared ages ago as it's for a challenge that's now been and gone. Yup, I've been that busy that I forgot to post a card for a challenge on our own Challenge Blog! Oh well! Thanks so much for stopping by here today! I really appreciate it - especially as I know I've been MIA recently! 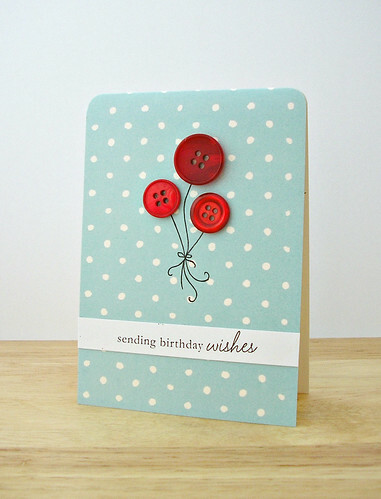 Love the bright red buttons on the soft blue, such a happy card. fantastically Cas and loving the polka dot background! Love this card! I'd really like to make it in every color imaginable. It's the perfect little birthday card to have on hand. Thanks for stopping by my blog and leaving such sweet comments also...you're too kind! Hugs! You do CAS so well and love your choice of colours too!